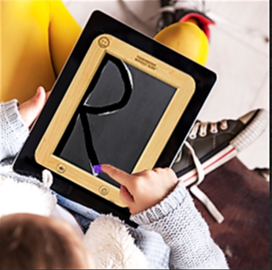 Bring the multisensory genius of the Handwriting Without Tears® Slate Chalkboard and Blackboard with Double Lines to your iPad with the Wet-Dry-Try app. Students can practice formations accurately, with correct start, sequence, and directionality—all based on our proven methodology. Verbal guidance from a personal handwriting coach provides instant feedback on errors and positive reinforcement. There are two editions of Wet-Dry-Try to provide the flexibility to accommodate any student environment—from a single child at home to the classroom, including 1:1, bring-your-own-device, and shared device scenarios. Learning Magazine Teachers’ Choice Award Winner For the Classroom and Family. Learn why the Handwriting Without Tears Wet-Dry-Try method works. Learn about the Handwriting Without Tears curriculum.